Today's offering from SolarCity allows retail investors to invest as much as $200 million in bonds in the leading U.S. solar financier and installer while providing the fast-growing company a new source of low-cost capital. Tim Newell, VP of financial products at SolarCity, said the firm is "proud to offer the first registered public offering of solar bonds in the U.S."
SolarCity acquired privately held financial technology firm Common Assets in January of this year, promising a web-based investment platform to allow "individuals and organizations" to invest in solar projects. Newell, a financial products expert who was then CEO of Common Assets, joined SolarCity as VP. Newell said that SolarCity CEO Lyndon Rive challenged him to create a product that could reach everyone, not just accredited investors. 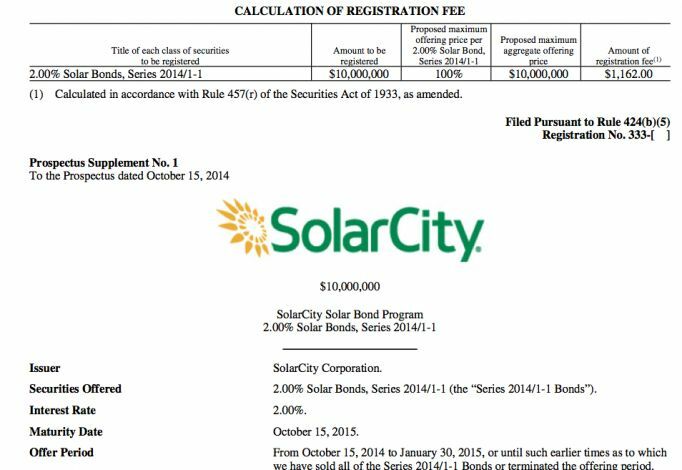 SolarCity has been successful in constructing investment vehicles such as tax equity partnerships, debt vehicles, and securitization. Newell added, "Those are just different types of investment vehicles backed by SolarCity's portfolio." "We wanted to make a bond offering to all investors," said Newell, noting that these bonds are not backed by a specific pool of installations as are its recent asset-backed securities, which are available only to large institutional investors. The new financial product "shares an attribute of crowdfunding," according to Newell. But a crowdfunding company is typically aggregating investors to finance a medium-sized solar project. Newell said it could be considered crowdfunding in that it is opening up investments that were previously available only for large investors "going through a financial intermediary." The SolarCity product does not use the crowdfunding exemption in the JOBS Act, which Newell said is "too limited and can't work at the scale we need to operate." He added, "We're similar to crowdfunding in that we're doing this directly through our own online platform with no fees to purchase. 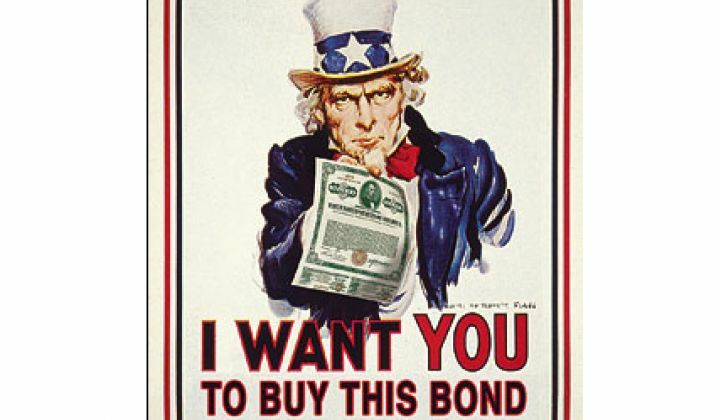 We don't look to earn revenue from the sales of the bonds." Bloomberg notes, "The rates are lower than SolarCity’s earlier bond offerings that were sold through traditional debt markets. The company raised $201.5 million in July, with a 2022 maturity date and a 4.03 percent interest rate. In April it sold $70.2 million of debt at 4.59 percent." Maturities for the new bonds range from one year to seven years with interest rates ranging from 2 percent to 4 percent. Greentech Media VP Shayle Kann notes, "The big innovation in this announcement is not solar-specific; it's the offering of simple, attractive corporate bonds to the general public. 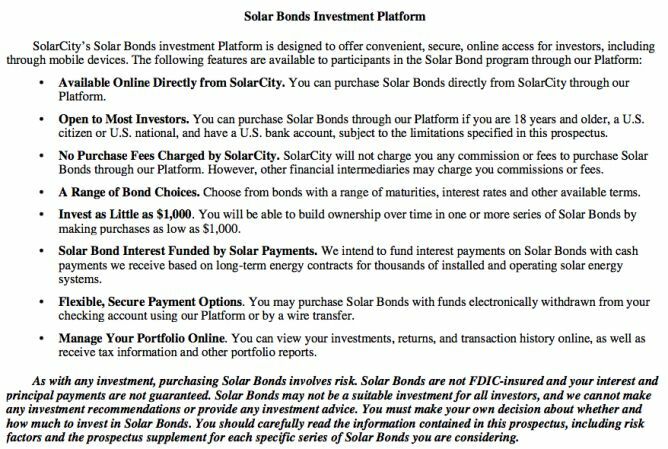 The fact that these are 'solar bonds,' meaning bonds backed by SolarCity's revenue streams, is just icing on the cake." SolarCity has not been bashful about innovating and acquiring in solar technology or solar finance. In the last year, the company acquired Silevo's solar panel technology and is now breaking ground on the largest panel factory in the U.S. The company acquired Paramount Solar and Zep Solar last year while teaming up with Texas homebuilders, partnering with BMW, offering several securitized notes and moving into energy efficiency, energy storage and solar loans. Even on the financial front, "This is very much part of the company's push to vertically integrate. This is an integration in the financing part of the equation. This allows us to do a few things," said Newell, adding, "It will attract a wider pool of investors, and should allow us to get the lowest cost of capital...across our financing platforms. [...] And reducing the cost of capital goes directly to reducing the costs of solar."